Details: Acknowledged as the best orchestra in the world, the Berlin Philharmonic under their principal conductor Sir Simon Rattle present Gustav Mahler Symphony No. 1 in D Major - a unique and breath-taking experience in the concert hall - with Sergei Rachmaninov Symphonic Dances - cut with scenes from Singapore in 3D. With the beginning of the first movement's principal theme the spectator arrives at the Concert Hall next to the Berlin Philharmonic. Mahler's first symphony lures the audience into a great symphonic world of sounds. 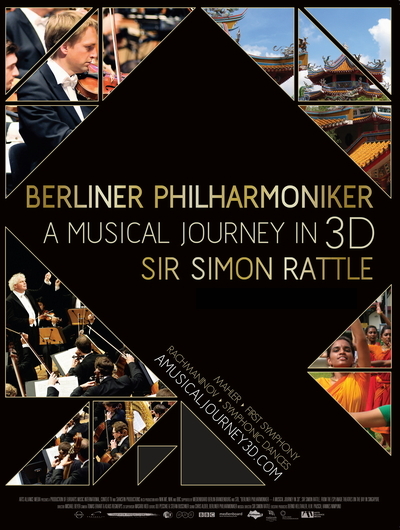 The film stays with the musicians and Sir Simon Rattle for the following parts of the symphony. Thus it gives the spectator the possibility to adapt and to enjoy the new 3D experience. The change between the two settings "orchestra" and "Singapore" reacts to the tunes, the tempo and the dance impulses of Rachmaninov's score. The second part of the film, Rachmaninov's Symphonic Dances moving and inspiring music is blended with 3D footage and stories from Singapore: subtropic and beautiful Singapore with its mixture of exotic environment, architectural beauty and nature. The outstanding acoustics and visual brilliance of Singapore's Esplanade Theatres on the Bay provide an impressive backdrop for the first 3D concert film to focus on classical music. They show the life of the people of Singapore as representative of the multiplicity of people in general. The tempo of the music is cut with a series of miniature stories that translate the music into magnificent 3D scenes. The Berlin Philharmonic feature first Concert Master Daishin Kashimoto.